Today is a leap day, a calendar oddity that helps align our timekeeping with the orbit of the Earth around the sun. But leap day may not be restricted to the Earth — it could occur on planets around other stars as well, as long as there are beings living there to mark the days, scientists say. The extra day of Feb. 29 is added to the second month of the year every four years, making that year a leap year, according to our Gregorian calendar. This extra day is necessary to keep our calendar in line with the seasons, which depend on Earth's revolution around the sun. That's because the year — the time it takes Earth to make one circuit around the sun — can't be evenly divided into days — the time it takes Earth to make one full rotation. "We have a leap year because the spin rate of the Earth, which is 23 hours and 56 minutes, doesn't divide completely evenly into the length of the year, which is 365.242374 days," said astronomer Greg Laughlin of the University of California, Santa Cruz. "You can't fit an exact number of spins into one trip around the sun without having some left over." And the same is probably true for most alien planets as well, said Laughlin, who is co-investigator of the Lick Carnegie Exoplanet Survey, which hunts for planets around other stars using the Keck telescope in Hawaii. Between this study and others, astronomers have now found more than 700 planets around other stars. 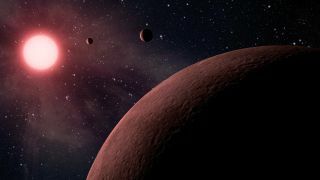 An exception are those planets found orbiting extremely close to their stars, which have become tidally locked, bound by their star's gravity to spin exactly once a year. These planets only ever show one face to the star, the other side permanently turning away, just as the moon orbits Earth, never showing us its far side. For all other planets, though, there shouldn't be any relationship between the planet's spin and its orbital period. "If tidal locking hasn't occurred then there's nothing to inform the planet about how fast it's spinning relative to its year," Laughlin said. "The spin of the planet depends on the gory details of its history." For example, if the planet was impacted by a large asteroid, that would likely accelerate its spin. Other planets, such as Earth, that have moons will have their spin slowed down through interactions with their satellites. In fact, Earth's spin is slowing over time, gradually lengthening our day. For now, the Gregorian calendar works, but it won't forever. "It's still not exact, but this system will work very well until at least 8,000 A.D.," Laughlin said. Then, we will have to decide whether to remove the leap day that year or not. The adjustment may be needed because even with the leap year system, Earth's days don't fit neatly into a year. If the year were exactly 365.25 days long, then adding a leap year once every four years would work perfectly. But the year technically lasts 365.242374 days (that's the length between one vernal equinox, when the sun crosses the celestial equator, or the Earth's equator projected into the sky, and the next). To compensate, the Gregorian calendar instructs us to leave out three leap days every 400 years, giving us the rule that years that are evenly divisible by 100 are not leap years, unless they are also evenly divisible by 400, in which case they are leap years. So, for example, the year 2000 was a leap year, but the year 2100, which would otherwise be scheduled to include a leap year, will not. This adjustment almost completely aligns the year with Earth's orbit, but not quite. By the year 8000, we may have gotten about one day behind where we are now, requiring us to potential omit that year's scheduled leap day. "It may be advisable to remove the leap day, but that will depend on what the Earth's spin does," Laughlin said. "We'll worry about that when we get there."